Mr. Kiner received his Bachelor of Science in Finance from the University of Florida in 1988. He then attended Nova Southeastern University where he studied law, and received his Juris Doctor degree in 1991. He has been admitted to the Florida bar since that point in time. Mr. Kiner has been practicing workers compensation defense since 1992. He worked with the law firm of Rigell and Leal, P.A. until February of 2002, and then worked for the Miller, Kagan, et al. firm through January of 2012, when he joined Eraclides, Johns Hall, Gelman, Johannessen & Goodman. Mr. Kiner was a partner for the Miller, Kagan firm for over 6 years and was responsible for running the firms’ Port St. Lucie office. Mr. Kiner practices in the Palm Beaches, Treasure and Space Coasts. 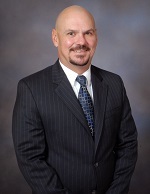 Mr. Kiner has represented numerous insurance companies and self insured employers. Mr. Kiner is a member of the workers compensation section of the Florida Bar and has been certified by the State of Florida as an educator in workers compensation topics.